Disclaimer:This is version 1.0 data. Improvements are being done. NSRC/ISRO disowns responsibility for any inadvertent errors, beyond its limitations. Disclaimer:Georeferenced Cadastral data available in this portal can be used for planning and development purposes and is not valid for measurements and regulatory applications. Citation:Data available from the U.S. Geological Survey. 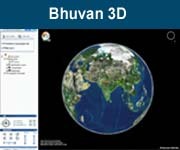 Please select the sector and click either or icons in the Bhuvan terrain to get Potential Fishing Zone(PFZ) information. To get the information about the particular coast, Please select coast from second drop down box after selecting the Sector. Please select for undo and for redo the current drawing. Click on Line/Polygon to know Length/Area.